Toys are primarily made to entertain kids, even adults! Children are like sponges for information, and that's why they need to have educational and developmental toys. Many toys on the market today provide kids with lots of fun and learning, and the number of educational toys is constantly increasing due to suppliers meeting consumer demand. But that doesn’t mean kids are automatically getting smarter. Remember that no matter how sophisticated toys are, without being properly demonstrated or taught your child’s toys may not fulfill their potential or may even be rendered useless because they're not played with correctly. It's essential for parents to be the child's first teachers. Don't just try to rely on electronic toys to guide them. True, those toys may teach your children the alphabet in a repetitive manner, but it's the parents’ appreciation and reward that keeps toddlers motivated to learn. And your encouragement is also considered as being interaction, which is also hugely important, as this allows us to both bond with our children, as well as help them to develop healthy relationships, explore in a safe environment, and slowly move towards the independence that we all need come adulthood. 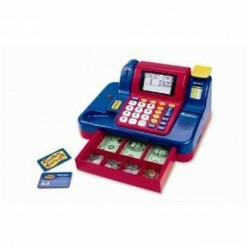 Giving your child their very own cash register will bring a lot of fun and laughter into your home. 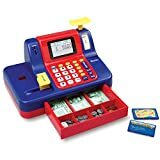 This cash register, by Learning Resources, has lights, sounds, and a voice message with every transaction. Every child will appreciate the size of this educational toy — it's the perfect size for toddlers. Not only can it hold real-size toy money; it also includes a toy credit card, bills, and coupons. It's even more fun if parents let themselves play with their little ones to promote child-parent bonding. That's just as good as the sibling bonding that comes from playing with sisters or brothers! Your kid will love this MOOOOOsical xylophone/piano. Boys and girls of all ages and all levels of interest in music will have a great time playing with it and exploring their talent for music. The xylophone alone rates an A+, and the piano feature makes it even better - better than any other xylophone toy on the market. The great thing about this toy is that it has no limits. Every child can make up their own tune anytime and anywhere, for just a few minutes or for hours of entertainment. This terrific developmental toy for toddlers is a great way to nurture or just explore your child’s talent for music. You never know ... maybe your child will become the next Mozart. This friendly little cow can help toddlers make beautiful "moo-sic" in two different ways. This educational toy makes five-year-old tots feel like they are adults, having their very own steering wheel just like Mom or Dad. It's a nice little toy, and not just appropriate for older toddlers, it's also educational too. They will love the cool sounds: the engine sound starts up on moving, and it even signals when going in reverse, and... um... the working horns really beep. The music in the pretend radio may be more pleasing than what you hear from your own car's sound system. This has everything - even more features than many real dashboards - such as its very own telephone. It actually drives like a real car: with its key, it turns on, then shifts, goes into drive, and also into reverse. Really cool! Puzzles never fail to entertain kids of all ages. Even adults want to have their own. Puzzles help to develop kids’ matching and association skills, as well as the sense of satisfaction that comes with finding exactly where to place a piece. This 32-piece puzzle will be a great hit with your kids. One recommendation to consider is to start with the small toddler puzzles, and laminate them as decorations when your child outgrows or tires of them. Start a toddler’s puzzle collection with these decorative, entertaining, and educational toddler toys. Younger toddlers love to play with a toy for days upon end until they are bored with it. So let them enjoy the Melissa and Doug Farm Friends Floor Puzzle to their heart's content before you turn it into a decoration, and above all have fun with it!